If you are looking for ways to bring creativity back into your classroom or strategies for teaching Common Core literacy, check out my Scholastic Top Teaching blog. Many of my classroom activities and teacher-created resources can be downloaded for free to use in your classroom. In addition to my blog, there is a impressive line-up of teachers offering something for elementary and middle school teachers. Don't stress over bulletin board ideas, money-saving tips, or lesson to use in your classroom. It been done for you, and it is free! Please feel free use my Common Core units in your classroom. They are listed in order that I teach them during the year. In return, all I ask is that you give me credit. You do NOT have permission to use my ideas or materials for profit. Do our decisions define who we are? Why is it important to consider different perspectives? How have children throughout history used technology to change the world? What does folk literature reveal about the universal values shared by many cultures? Designing engaging materials for my classroom is what I do for fun. You might call me a little obsessed. Below are some of the teacher guides I created or contributed to as a team project. I hope you enjoy them. Let me know what you think. These time-saving Common Core literacy lessons and activities support the first eight books in I Survived series by Lauren Tarshis, a hot adventure, survival series. Visit Scholastic to download the free teacher's guide (PDF) with printable handouts. It's the perfect resource for the busy teacher. This Common Core teacher's guide accompanies the popular, high-interest biographies in the I Am series by Grace Norwich. You can download the free guide (PDF) from the Scholastic web site. The before, during, and after reading activities will turn your students into heroic trailblazers. If you are a fan of the I Survived series by Lauren Tarshis and Scholastic Storyworks, you will love the Storyworks Common Core Reader: Disaster and Survival. Download this free teacher guide with fantastic lessons and activities. a collaborative efforts of many talented people at Storyworks. 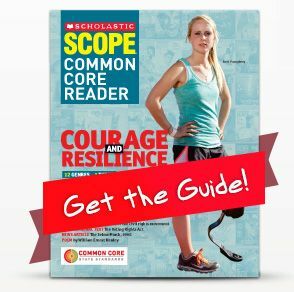 Being on Scholastic's team of innovative people who created the Scope Common Core Reader Teacher Guide, was a highlight in my career. The Scope Common Core Reader includes what I refer to as Scope's timeless classics: stories, articles, and poetry. Download lesson plans, activities, performance tasks—all the support you need! This is one of my favorite test-prep activities published on Scope Ideabook. It definitely prepares my students for state tests. Even though this activity was created to accompany "Follow the Water" in the September 2017 issue of Scope, it is applicable to any fiction text you are using in the classroom. As a member of the 2018 New York State Reading Association Charlotte Award Committee, I encourage all New York State teachers to join in the reading frenzy. We will loan you a box of the 2018 Charlotte Award books for your grade level, so your students can read and vote for their favorite books. Visit the NYSRA Charlotte Award web page for submission guidelines.